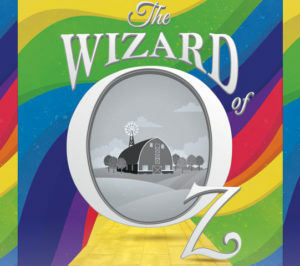 Go somewhere over the rainbow this holiday season with Media Theatre’s production of The Wizard of Oz. Be enthralled by the beloved tale of a Kansas farm girl discovering the magical power of home that has entertained audiences for generations. After its 1939 release, the movie version has been an annual treat on the small screen for families and kids of all ages. Now the story comes to life in this stage musical version by Media Theatre. As a whirling tornado sweeps young Dorothy away to the magical Land of Oz, she must use her wits and three brainless, cowardly and heartless allies to find her way to the City of Oz to convince The Wizard to take her back home. But her journey is fraught with peril. The Wicked Witch of the West is after Dorothy and the ruby shoes the Good Witch Glinda gave her for the journey. Will she make it to Oz safely? No spoilers here! See the show to find out. Anna Rosenthal is off to see the wizard, as she plays Dorothy. This talented young actress from Philadelphia is no stranger to Media Theatre’s stage, with prior roles in Billy Elliot and Bridges of Madison County. Oz is brought to life by a professional cast of actors, including several other of Philadelphia’s award winning stars—Jennie Eisenhower (Wicked Witch), Elisa Matthews (Glinda), Kelly Briggs (Cowardly Lion), Bob Stineman (Tin Man), and Carl Smith (Scarecrow). JP Dunphy is Uncle Henry and the Gatekeeper, and Media’s own Roger Ricker is The Wizard. So grab your flying monkeys, but leave your buckets of water at home, and witness the incredible journey down the yellow brick road.